Sarah Carlson is a Bank Street Graduate with an M.S. Ed. in Early Childhood Elementary Education, and has taught in a variety of public and private school settings in New York, New Jersey and London for the past 17 years. She is certified as a Forest School Kindergarten Teacher through Cedarsong Nature School. Sarah holds Permanent Certification in both New York and New Jersey. She is certified in Infant, Child and Adult CPR and First Aid. Sarah is inspired by children's authenticity, energy, and expression and is rooted in the idea that we are always learning through experience, reflection, and finding the magic in day to day moments. She believes strongly in the freedom, health, and creativity that ample time in nature can provide. Originally from New York City, Lilly Clark graduated from Brooklyn College with a B.A. in Childhood Education, minoring in Sociology. She continued her professional studies at Bank Street College of Education, focusing on the Reggio Emilia approach. Lilly believes in nurturing the whole child through unconditional acceptance and compassionate interactions that are respectful of the child's ideas, input, and social-emotional development. In her spare time she enjoys yoga, book club, color-coding spreadsheets, and exploring the city by bike with her family. Lilly is certified in Infant, Child and Adult CPR and First Aid. Susannah is originally from Hershey, PA, but has been a Brooklynite for 14 years. She holds a BA in English with a minor in Women's Studies, an MFA in Poetry, and has 6 years of classroom experience with ages 2-5. Susannah has also continued her education with courses and certificates through CUNY's New York Early Childhood Professional Development Institute. She is certified in Infant, Child and Adult CPR and First Aid. Susannah believes that children are powerful in both body and mind and that they possess the skills and strength to complete difficult tasks autonomously. She loves the freedom of play and nature-based teaching and is excited to be working with Brooklyn Nature Days. Susannah lives in Cobble Hill with her husband and two young sons and loves biking, reading Scandinavian crime fiction, watching Buffy, and playing strategy board games. Myllicent is a certified NYS Early Childhood Teacher (Birth-2nd grade) and has a Master's degree in Early Childhood Education from Brooklyn College, CUNY. Before changing careers, she received her BFA from Purchase College, SUNY in Theatre Design/Technology with a focus in lighting design, in 2013. Mylli has taught in many different classroom settings, and loves the freedom and inquiry that comes from play-based and child-led learning. Since joining BND, Mylli has found that she is a devoted bird nerd and has dedicated a lot of her time to learning more about the natural world. She is certified in Infant, Child and Adult CPR, AED and First Aid. Myllicent lives in Prospect Heights with her husband and her two cats, Oliver ("O-bear") and Delilah ("Doodle"). In her free time, she enjoys healthy cooking, reading non-fiction, cuddling with her cats, volunteering for her neighborhood CSA, and standing up for a better future. Alice Ryan is a graduate of the Pacific Conservatory of the Performing Arts and hails from California. She loves spending time with kids and has over a decade of childcare experience. It brings her great joy to share her passion for music, dance, and storytelling with the kids of Brooklyn Nature Days. Alice is certified in Infant, Child and Adult CPR and First Aid. Anna Fitzgerald grew up in Connecticut's "quiet corner," volunteering there as a Big Sister (BBSS), studying Anthropology and Journalism while covertly liberating green houses on campus and collaborating on a few food gardens. Since moving to Brooklyn nearly 10 years ago she’s produced several literary projects for terraphiles and worked as a nanny for mermaids, a few Elsas and one space loving dinosaur. Before she started teaching at BND a few years ago, she coordinated educational all-ages events at the community arts venue she co-founded in Bushwick, where she now lives. She is wild about the park’s many-legged and the single-footed, hopes our kiddos come to recognize the calls of the feathered, and really will not cool it with the Linden blooms. Anna is certified in Infant, Child and Adult CPR and First Aid. Amos grew up exploring the lush forests, swamps and gardens of Central Florida, which gave him a lasting appreciation for the outdoors. After several years as an elementary school teachers’ aide, where he led students through countless trips and activities, he moved to New York and along the way, his love of nature returned to the forefront. Amos is excited to return to an educational role with Brooklyn Nature Days and instill his love of plant life, nature and the outdoors in the next generation of nature lovers. In his spare time, you can find him in his pottery studio, on a climbing wall or hiking trail. He's currently studying to acquire a certificate in horticulture therapy. Caroline was born and raised in Boston, MA & considers herself a radical educator. She traveled every summer with her family to southern Maine and discovered a love of the outdoors during her early years there. Caroline has been living in New York for nearly 10 years and has worn many hats including preschool teacher’s aid, coach, nanny, gymnastics instructor, art therapist, and mentor. During her time in New York, Caroline has spent most summers traveling the country for various social justice causes, most recently traveling to Standing Rock, North Dakota to document and support the struggle of the native people to protect their sacred lands. She feels strongly that environmental educators have a responsibility to be strong advocates for the environment, all day, everyday, and especially now. Caroline currently attends Hunter College where she is an undergraduate, majoring in Women and Gender Studies with a minor in Environmental Studies. Caroline is certified in CPR and Pediatric First Aid. Ellie grew up in the woods of Connecticut hiking, splashing in the river, catching frogs, and gardening with her mom. She attended Vassar college in Poughkeepsie, NY where she received a BA in Educational Studies. While in college, Ellie discovered her love for outdoor education working at a farm gardening and cooking with children. After graduating, her passion took her to San Francisco where she spent a year as a garden teacher for a public elementary school and a year as a teacher at a forest preschool in San Francisco's Presidio National Forest. Ellie is so excited to be continuing spreading the magic of forest preschool education back on the East coast with Brooklyn Nature Days! Gemma Inguanta hails from Long Island, NY. She holds a BA in Sociology with minors in Gender and Sexuality Studies and Social Work. Gemma's journey includes having the privilege to travel the country for social justice causes, nannying for a mischievously wonderful little girl, farming in Upstate New York and most recently working as an educator at a Queens based farm. Her love for children stems from her intuitive and playful nature. She adores and cherishes children's creativity, imagination, and insatiable desire to learn and ask questions! Gemma is driven by her firm understanding and knowing that nature, spirituality, and love will create a better future for all children. In her spare time she likes to learn about herbalism, do yoga, and get out into nature! She is hoping to begin her Masters of Social Work in the Fall of 2019 and is delighted to be a part of the Brooklyn Nature Days movement! Jan is thrilled to join the Brooklyn Nature Days community. Raising her two kids with her schoolteacher husband near Prospect Park -- and often in it - she feels very much at home outdoors and is eager to experience it anew through the children’s eyes. For the past seven years, Jan has volunteered in the ornithology department at the American Museum of Natural History. Before moving to Brooklyn in 2010, she helped create an overnight place-based education program for middle schoolers and collaborated with teachers on a school garden initiative in Ashland, Oregon. Previous lives include touring with a theater ensemble as a juggler and trapeze artist; other interests include baking, watching old films, and taking her kids bird watching. She received her BA in Anthropology from Penn and an MS in Environmental Education from Southern Oregon University. Jess is a New York City native who comes to Brooklyn Nature Days with a decade of professional childcare experience, including founding, directing, and teaching in her own co-op play school in Park Slope. Jess is an avid reader, frequent Hudson Valley hiker, Krav Maga practitioner, and is highly enthusiastic about dogs, particularly her spaniel mix, Cannoli. She is certified in infant, child, and adult CPR and first aid. Kate grew up a block from the ocean in Long Beach, NY and has been living in Brooklyn for over 10 years. As a young teenager, her very first job was as a babysitter, and she has continued to work with children ever since. More recently, Kate has worked as an after-school counselor, a Montessori preschool teacher’s aide, a guitar teacher, a summer camp counselor, and as a nanny for children and infants as young as 2 months old. She is certified in Infant, Child and Adult CPR, and First Aid. When she's not working with children, Kate travels the world playing music with her band. Keith grew up in Manhattan and nearby Montclair, NJ. He developed a love for nature through constant visits to the zoos and parks of New York City and his summers spent by the shore in Cape Cod, MA. He studied wildlife biology at Unity College (Maine) and worked in several zoos and nature centers over the next ten years. Working with children and nature became his main focus over that time as he served as the out-of-school time coordinator at the Staten Island Zoo, where he oversaw all summer camp and afterschool programs. He is currently finishing his Masters in inquiry based learning through Miami University’s Advanced Inquiry Program located at the Bronx Zoo. The Proudest New Jerseyan you'll ever meet, Lily has loved nature, animals, and the outdoors for as long as she can remember. She received her BA in Biology from Bard College in 2015, where she focused her studies on ecology and conservation biology. Lily loves sharing her passion for nature, wildlife (especially bats), and science with others. An aspiring conservation biologist, she believes that conservation is as much about people as it is about what must be protected, and she is committed to help others fall as in love with nature as she has. Lily has worked as an environmental educator for the past several years, serving with AmeriCorps in northwestern New Jersey and with summer camps at Central Park Zoo. When she's not educating the future naturalists of America, Lily loves hiking, birdwatching, and touring with her band. Manja grew up in Berlin, Germany and has a degree in Early Childhood and Adolescent Education from the Friedrich Fröbel School for Social Education. Now approaching her 10th year as a New Yorker, Manja has taught in classrooms all over the city and is excited to bring her love of exploration and discovery to the students at Brooklyn Nature Day. She lives in Sunnyside, Queens with her husband and son and in her spare time she tirelessly surveys the bagels of New York with heroic determination. Meg, a central Pennsylvania native, earned her Bachelor and Master of Music in Vocal Performance from the University of Delaware. Over the years, Meg has had extensive experience with children as a babysitter, voice teacher, and paraeducator. Meg certified in Infant, Child and Adult CPR. 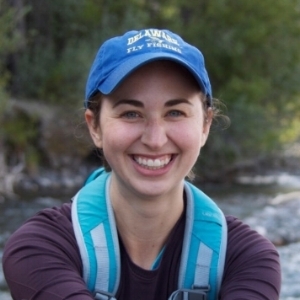 Growing up surrounded by the Appalachian Mountains, Meg developed a deep love of nature and she is excited to share that with the students of Brooklyn Nature Days. In her spare time, Meg loves yoga, travel, cooking, and snuggling with her roommates dogs. When she was 12, Nicole had her first job working at a day camp in Bush, Louisiana. Summers spent leading hikes through Louisiana’s wetlands have inspired her love of nature ever since. She is a graduate of Fordham University and has worked with children for over 8 years. When she’s not working, she enjoys reading about food science, baking, and going to see live music. Nina Troy just moved to the big city from the mountains of Asheville NC where she lived for two and a half years after graduating from Guilford College in Greensboro NC with a BA in Theatre Studies and a minor in Education. While living in Asheville, Nina was a preschool teacher in the young threes classroom of a Kiddie Academy where she fell in love with teaching and working with kids, she loved coming up with lesson plans that involved hands-on experimenting, paint, and making huge messes. Since moving to NYC, Nina has been homesick for the Blue Ridge Mountains and is thrilled to have found a place where she can reconnect with nature and continue her passion for teaching. In her spare time, Nina likes crafting, drawing, and adventuring. She lives in Bed-Stuy with her husband and their little black cat, Bruce. Sean is a graduate of Florida State University with a diverse background in the recreational nonprofit world. A true Florida native, Sean has spent majority of his summers teaching children the joys of the outdoors at 4-H summer camp, from kayaking to archery. He spent his final years in Florida making wishes come true for kids with life threatening illnesses at Give Kids the World in Orlando. Sean moved to Brooklyn earlier this year, and is looking forward to all of the adventures Brooklyn Nature Days has in store! Kelly has been teaching yoga to people of all ages for over a decade. In 2007 she left her successful advertising career for the yoga mat and never looked back. Her passion for the practice truly shines whether she is 'playing' yoga with children, helping teens meditate, or guiding adults through a creative flow. Highly regarded as a kids yoga expert, Kelly spent four years regularly traveling the world training kids yoga teachers. She resides in Brooklyn and teaches in schools, studios, and privately in homes all over the city.